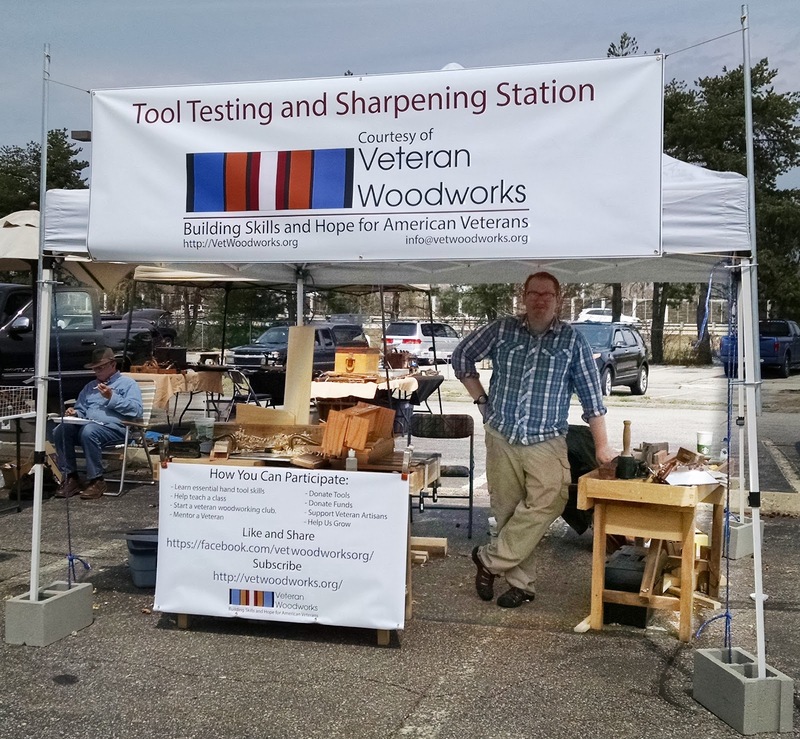 Ken Aucremanne at the Veteran Woodworks booth. This past Friday and Saturday, Ken Aucremanne and I setup a Veteran Woodworks booth at the Martin J. Donnelly Auctions "Live Free or Die Tool Auction" in Nashua, NH. This is a bi-annual event featuring some of the best antique tool sales in New England. In addition to the 2-day formal auction inside, there are always extensive parking lot sales out back, this time starting 2 days before. You know how occasionally at flea markets you find that one good tool guy? Imagine an entire hotel parking lot like that. Yeah, start drooling. Fully half of my personal and student tools come from here. Ken had called and spoken to Kathy Donnelly to inquire about having a space, and she had said to come on out. I brought my portable sharpening station and my portable Roy Underhill workbenches. Everyone always loves both of these, so I bring a copy of Roy's book The Woodwright's Apprentice: Twenty Favorite Projects From The Woodwright's Shop to show them the workbench plans. The weather Friday was gorgeous, sunny and warm, all the way up to 78 degrees (the week before the low had been in the teens). We spoke to a number of people, collected names for our mailing list, and I sharpened a few tools. Several of the vendors generously donated tools, all good users in good condition. James gave us two '20's/'30's era Vaughan and Bushnell planes, 905 and 904, plus an unmarked Bedrock 604 clone from the same period. The V&B planes were drop-forged from single ingots of vanadium steel, so were marketed as unbreakable compared to cast-steel planes. Drew gave us a '60's era Disston hand saw and some big bar clamps. We also received donations of block planes, marking gauges, braces, and a push drill. Thank you to all who donated! Proper storage for these items is now a priority, so my next project will be a couple of the toolboxes from Toshio Odate's book Japanese Woodworking Tools: Their Tradition, Spirit and Use , one long for saws and one short for everything else. These are simple, portable, and stackable, ideal for kitting out group sets. I'll add a sliding dovetail locking bar for the lids. A storm moved in late afternoon, sending everybody scattering and dropping the temperature by 20 degrees. Unfortunately, Saturday was a major bust, cold and rainy, most of the outdoor vendors gone. Ken went in and asked if we could set up a table inside, and they graciously gave us a spot at the entrance. Inside, we met Martin and Kathy. They each took a few minutes from the controlled chaos of the auction to speak with us, and were very supportive, so I want to give them a big thank you. The tools for sale inside and out run the gamut, the full range of age, condition, and price. Lots of good users and lots of obscura for collectors. From the ball of rust on a tarp in the parking lot that may or may not contain an actual tool to the spectacular one of a kind that will command eye-watering price and take pride of place. This a great way to build up a starter set, though it can be confusing for a beginner to know what to get, especially when trying to hold to a limited budget. Frank, one of my JOTMOST students, met me Friday morning and we scoured the vendors to assemble his set. I told him to prioritize on his primary tools and not worry for the moment about chisels, since the hardware-store grade ones he already has are usable for now. Chisels are the easiest problem to deal with. Focus on the harder-to-find items, and don't buy the first one you see, hold out for a good deal, even if it requires a little more restoration. So we were able to find all the rough and fine joinery saws and a full suite of planes, plus router, saw set, saw vise, and sliding bevel, for $190. With his chisels, he's now fully equipped, even for saw sharpening. The planes are all marked with 1902 patent date. The other tools I would guess are from somewhere between WW I and WW II. The large saws of course were all fully rusted, but had good straight saw plates and good teeth, so will clean up just fine. The joinery saws just need dental work. Clearly our next JOTMOST session will be on tool restoration!